Located at the Blues Ranch on the Methow River in the resort town of Winthrop, Washington, the Winthrop Rhythm & Blues Festival is a three-day event packed full of exciting national and regional entertainment for all ages. There is on-site camping, food and craft vendors, portable showers, and a beer garden. The Blues Ranch is the perfect setting for one of Washington’s finest music festivals. The Winthrop Rhythm & Blues Festival is the largest and longest running blues festival in the state of Washington. Over eighty thousand people have attended this event in the past twenty-nine years. 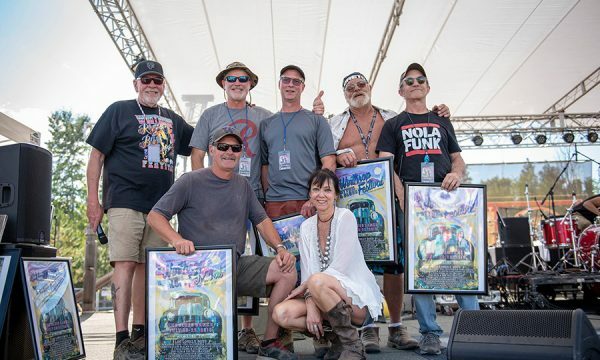 Past festivals have featured such national artists as Los Lonely Boys, Samantha Fish, California Honeydrops, Lukas Nelson & Promise of the Real, Robert Randolph & the Family Band, Johnny Winter, Royal Southern Brotherhood featuring Cyril Neville and Devon Allman, Allen Stone, The Holmes Brothers, Roy Rogers, Janiva Magness, Ivan Neville’s Dumpstaphunk, Too Slim & the Taildraggers, Jimmie Vaughan, Booker T., Commander Cody, Little Feat, Mavis Staples, Bo Diddley, JJ Cale with Christine Lakeland, Bobby Rush, Susan Tedeschi, Koko Taylor, The Fabulous Thunderbirds, Tower of Power, Delbert McClinton, Elvin Bishop, Little Milton, Tommy Castro, Eric Burdon, Chubby Carrier, Charlie Musselwhite, The Blasters, Buckwheat Zydeco, James Harman and many others. The festival has rightfully become a destination event with fans traveling from all over the world to enjoy and celebrate the Blues. The Winthrop Rhythm & Blues Festival is brought to you by Winthrop Music Association (WMA), a 501(c)3 non-profit organization. All board members, staff and volunteers pride themselves in providing the very finest in rhythm & blues entertainment each year. We look forward to another great year and hope to see YOU at the 32nd Annual Winthrop Rhythm and Blues Festival!! Winthrop Music Association (WMA) is a 501(c)3 non profit organization formed in 2005 to ensure the continued success of the Annual Winthrop Rhythm & Blues Festival. WMA strives to promote arts and cultural activities in the Methow Valley and beyond. WMA is a supporter of Methow Valley School District Music Program, Methow Arts, Methow Valley Theater, Room One, Washington Blues Society Musician Relief Fund, Inland Empire Blues Society, Cascade Blues Association, The Cove food bank, Methow Valley AAU Basketball Booster, Tommy Zbyszewski Methow Valley Education Foundation scholarship and others. If you are interested in performing at the 2020 Winthrop Rhythm & Blues Festival, submit your EPK no later than December 31, 2019 to talent@winthropbluesfestival. We begin reviewing talent in the late fall. Keep in mind that we only have 12 slots for our festival, and competition is keen for those few slots. If we are slow to respond to your submission we apologize. For the handful of slots reserved on the Festival lineup for regional acts and lesser known national acts (the rest being filled by the proven touring acts and headliners we actively seek) we are inundated with submissions. We are a volunteer-run organization and can be overwhelmed by the sheer volume of submissions. Bands can submit EPKs however works best for them or they can submit a hard copy. We have much respect for all of you as a musicians, performers, businesses. Putting together a festival lineup is much like curating a museum exhibition, and we look to regional acts to complement and round out the lineup shaped by our headliners.